The beekeeping sector is composed of various actors. Amateur, multi-active or professional beekeepers; honey producers nevertheless keep a common need: package their exceptional honeys using the filling machine (automatic or semi-automatic), the labeller (automatic or semi-automatic) or the complete line that will best suit their needs in terms of speed and product ranges. CDA offers solutions for everyone. For nearly 30 years, CDA has designed and manufactured a wide range of custom-made filling, labelling and packaging machines for honey producers. With many of our customers, we have developed packaging solutions that meet the requirements of a sector in search of quality for its products. Our wide range of semi-automatic and automatic machines allows us to meet the needs of both small and large producers. Filling your liquid honey, creamy honey, solid honey… Labelling of your cylindrical, faceted jars of all shapes and sizes… CDA relies on its expertise to guide you towards the machine that meets your needs but above all your products. A semi-automatic labeller will be the best choice for producers looking for a labelling solution for a small or medium production. Whatever the shape of your jar, tube or honey canister and its capacity, CDA adapts its labelling machine to the specificities of your product. The automatic labelling machine will be a must-have for professional beekeepers who regularly pack large honey productions in pots, tubes or cans. Depending on your production rate requirements, the shape of your products or the number of labels to be applied to your products, various automatic labelling machines offered by CDA can meet your needs. For a limited production of honey and depending on the viscosity of your production, a semi-automatic CDA beekeeping filler may allow you to package your jars, tubes or cans. Our experts advise you according to your products. For precise filling of your honey jars, tubes or cans, whether they are made of glass, plastic, cylindrical, faceted… CDA offers you an automatic honey filling machine corresponding to the desired speed and equipped with a pumping system adapted to your production. If our expertise lies in the packaging of your beekeeping products, CDA also offers a whole range of complementary solutions for screwing, loading, marking or even conveying your pots, tubes and honey cans. Ask our experts for advice. Precise weight filling, quality labelling for exceptional products, mandatory or special indications, presence of multiple labels; the packaging requirements for beekeeping products are numerous. In collaboration with many beekeepers, CDA has been designing and manufacturing labelling machines, filling machines and packaging lines since 1991, adapted to the specific characteristics of honey, its different textures and viscosities, its various container formats and its high precision requirements. The beekeeping world, made up of passionate amateur and professional producers, is delighted by the quality of the products on offer. Monoflower honeys of acacia, chestnut, rosemary, lavender… Polyfloral honey called “from the mountains”, “all flowers” or spring or summer honey… The many varieties of yellow nectar are popular in small markets and supermarkets. Beekeepers therefore compete with each other in their imagination to enhance their products, with an increasingly high-end dressing, in the colours and appellations of their honey. Through an extensive packaging solutions offer, CDA meets the diverse requirements of small producers, experienced beekeepers and more industrialized productions looking for variable filling or labelling rates. Whatever your need, our team will assist you in your packaging project. Smaller honey producers are often looking for packaging materials that allow them to optimize the filling and labelling of their honeys. Acquiring a semi-automatic labelling or filling machine makes it possible to make a transition between manual and automated packaging, thus resulting in a significant increase in productivity. A professional beekeeper may need a more general automation of his honey packaging processes. 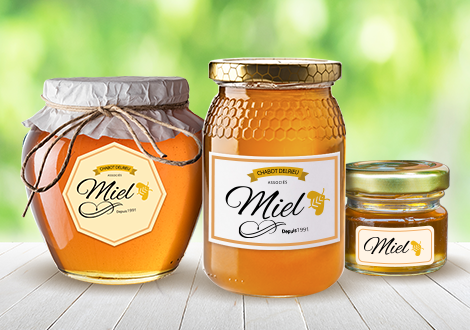 Automating the filling and labelling of honey jars in a production that is beginning to become significant will allow the development of a range of products that will increase productivity and brand image. Evolutive CDA solutions enable future growth. Large groups that already have packaging equipment or even existing lines will find among the CDA machines equipment that allows them to extend their range or fully automate it through a packaging line that ensures filling, screwing and labelling in a single operation. Easily adaptable to existing and scalable chains, CDA solutions are customizable.